and left a request to be notified when a P210A Target model was in stock. BINGO!!! I scored! This is a beautifully made pistol from the Sig with all the attention of a Custom Shop model but priced for the folks that want to actually shoot it. 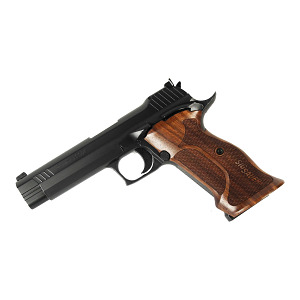 Large walnut ergo grips, tight fitting slide and a light 3#-4# target trigger. Excellent competitive prices and the very best customer service from Top Gun Supply, you just can't go wrong purchasing from them. No other online dealer takes care of their customers the way Top Gun does. Service was excellent, ordered over the phone, gun recv'd 3 days later. Gun is beautiful, can't wait to shoot it. Very happy with transaction all around. Thanks again Geoff. True to what many shooters claim that this gun is truly a target piece. It is easy to shoot and the trigger is superb. It is very light and crisp with just a little take off before it breaks. First 200 rounds without any hiccups. I am waiting for the carry version. Mine shot to the left and adjustment zeroed it in the middle. You will never regret getting this gun.